Might I just add that CO did a fantastic job putting on this tournament. The layout was excellent. Parking was no prob. It wasn’t hard to go from field to field. Let’s hope this tournament becomes one of the early jewels of the SoCal passing circuit for years to come. Bishop Amat showed the first of many signs that its fans are in for a special season by beating Upland to win Saturday’s Charter Oak Passing Tournament. The Lancers were led by the duo of receivers Tyler Vaughns and Trevon Sidney. The team advanced through pool play unbeaten and then beat Keppel, Rancho Verde, Loyola and Upland in the knockout. Upland beat Charter Oak in the other semifinal. Hagerty singled out his defense as what impressed him most. He also said that both quarterbacks Damian Garcia, who started the first game of the day, and Ryder Ruiz, looked good. Garcia and Ruiz are in a battle to be the starter after having big moments last season. James Heggins is back as Baldwin Park High School’s football coach … for now. Heggins, also the school’s AD, served as varsity football head coach for seven season until resigning in 2012. He was tasked this offseason with finding a replacement for Daniel Algattas, who resigned after one season. Heggins had his man, but the deal fell through and rather than having a headless program, he decided to return until a new coach can be found. “I can’t just sit back, I’ve got to do something to get them started,” Heggins said of Baldwin Park’s football players. “I’ve got a plan in to get someone in place later this summer. Timing is everything and the hiring process can take longer than you think. That will mean double duty for Heggins, who also coaches defensive backs at Mt. San Antonio College. He will try to balance both positions. Heggins graduated from Baldwin Park in 1993 and played at Mt. SAC and later San Diego St. Heggins was 41-35 in his seven seasons and guided the Braves to a share of the Valle Vista League title in 2007. Editor’s Note: We’ll do another one of these somewhere around mid-summer. But for now this should be a pretty guideline based on all the types of things that can effect programs — transfers (coming or going), suspensions and so on. 1. Bishop Amat — Loaded … with plenty of questions. 2. La Mirada — So many transfers it would make Upland blush. 3. 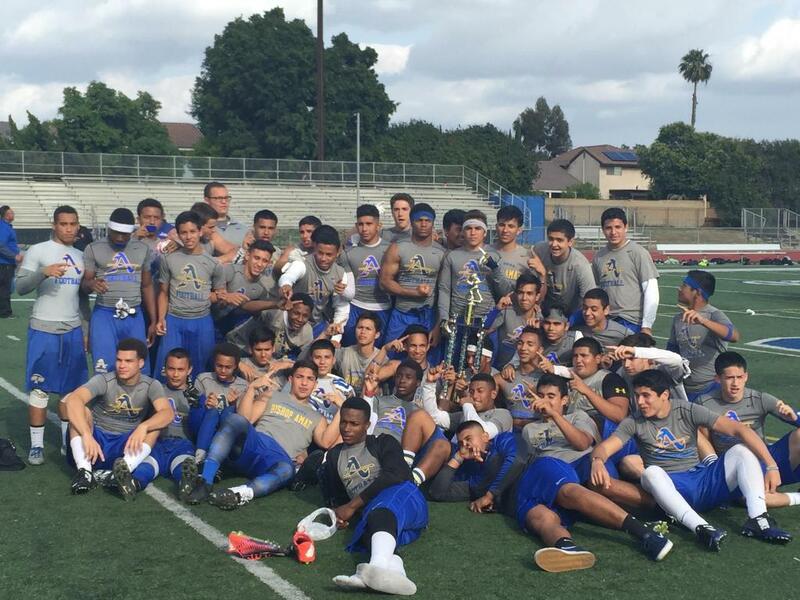 Charter Oak — Will dazzle at passing tourneys, but what about the line? 4. Glendora — Should be okay with a USC commit at QB. 5. West Covina — Calling for the ‘Dogs to become elite again. 6. St. Francis — Not the best of offseasons from a departures standpoint. 7. San Marino — Won’t stop elite teams but offense should be sick. 8. Northview — Safe to predict another year like ’14. 9. Pomona — QB Lockett will take Devils as far as he can. 10. La Serna — Serious concerns about the coaching situation persist. 11. La Habra — Has had an offseason to shore up the defense. 12. Damien — This is a slow, steady rebuild. 13. Muir — Very speedy team but will all of it jell? 14. Monrovia — Lots of people doubting ‘Cats can rebuild/reload. 15. Los Altos – In Nevens LA trusts. 16. Bonita — This has the makings of a surprise team. 17. South Hills — Keep getting mixed signals about the talent level. 18. Diamond Ranch — Don’t like what’s going on atop the program. 19. San Dimas — Defense should be honest. But Z departure is huge. 20. La Salle — Where do you go from a 3-win season if talent level drops? 21. St. Paul — Some say program is clawing its way back. 22. El Rancho — And now the head coach leaves? 23. Claremont — If ‘Pack have matured, watch out. 24. Azusa — Will usual solid self thanks to the offense. 25. Montebello — Good run game, solid D. Typical. FIRST GAMES FOR ALL: 8 a.m.